There is something almost magical that happens when your audience laughs with you. You know that they’ve been using their listening skills and there is a connection that is formed for that brief moment that allows both of you to share an experience. Forget presentation tips, the more times that you can make that laugh connection happen during a presentation, the deeper your ability to connect with your audience will be. Since this is such a big part of the importance of public speaking, the big question is what can you do to get your audience to laugh more…? When a speaker decides that he or she would like to include more humor in their speech, they’ll often go looking for funny stories or jokes to add to the speech. It turns out that this is going about it in the wrong way. One of the greatest sources of humor that every speaker can draw on is real life. So much happens to each of us during a given day that we have an almost unlimited source of humorous material available to us. All you have to do is to take the time to look at what’s going on in your life and you’ll have the material that you are looking for. As speakers we really don’t know what kind of day our audience has had before they came to hear us speak. As a speaker you are going to want to deal with this issue early on in your next speech. What you’ll want to do is to find a way to get your audience to relax. The best way to make this happen is to get them to laugh. Note that that they don’t have to laugh with you – they can be laughing at you. It really doesn’t matter as long as you provide them with a chance to laugh. This will relieve the tension that they may be feeling and will prepare them to enjoy the rest of your speech. I’m almost hesitant to bring this technique up because it can be difficult to use correctly even in the hands of a seasoned professional speaker. Shock humor is the type of humor that your audience never saw coming. Classic examples of shock humor include humor that contain profanity or sexual references. Yes, that can work, but it can also turn your audience off. A much more powerful form of shock humor is the type in which you insult someone or something. The audience may have been expecting you to say nice pleasant things and here you go dropping pointed barbs. You’ll have your audience’s attention and they’ll be chuckling at the surprise that they are feeling. One of the most difficult and rewarding things that a speaker can do is to get your audience to laugh with you. The ability to do this multiple times during a speech is how we are able to tap into the benefits of public speaking and is a skill that we all need to be always working to develop. There are three ways that we can go about improving our ability to connect with our audience through laughter. Using the truth can often bring out a laugh in any crowd. 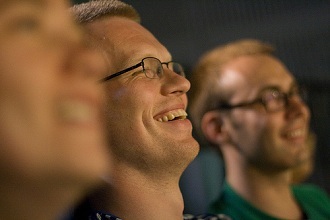 Putting your audience at ease helps to get them in the mood to laugh. Finally, humor that is completely unexpected, shock humor, will always get a reaction from your audience. Not every technique is right for every audience or every situation. Make sure that you know who you’ll be talking to and take the time to tailor your humor so that you’ll create multiple opportunities to connect with your audience during your next speech. Question For You: Do you think that it is ever possible to shock your audience without offending them? Should Public Speakers Use Blue Humor In Their Next Speech?